The following review was put up on "The Star" website and I thought I would share it hear as it amused me. Was you at this show? Did you hear what the woman said when she came back from the toilets? The Psychic Sally on the Road 2015 tour visited Doncaster - and turned into a bit of a car crash. 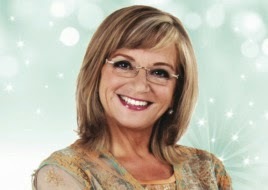 When I heard Sally Morgan was coming to the Doncaster Dome, I was very excited. Having seen her at the same venue a few years ago, she had not just been entertaining but also very accurate, so it surely promised to be a great night out. While helpful staff showed us to our seats, I looked around the venue and it was obvious that many people were looking forward to the night’s event. Sitting back, I took a minute to soak in the atmosphere, a mixture of excitement, expectation, and hope. Sally took to the stage and explained a little about what she did and then began by giving a name of a person in spirit. People were looking around wondering who the fortunate person was, but it seemed no one knew the spirit who had come to say hello. This seemed to be the mantra of most of the evening. Many names, dates and other details were given, but for the most part, things were not very accurate. I wondered if mediums have off nights, because Sally Morgan was definitely having one tonight. It was the total opposite from the last time I saw her. The highlight of the evening came from a young woman in the audience who had her “message of love” picked out while she had decided to go to powder her nose. She returned to her seat to rapturous applause. She told Sally that while in the ladies, as she looked into the mirror, she thought about her granddad who had passed away and what a lot of rubbish (not quite the words she used) this was. It certainly made everyone laugh, but was it her granddad giving her a sign or was it just coincidence? One thing I am sure of however is that I was not the only person going home somewhat disappointed.